Suitable for dry use, in bath and under the shower with anti-slip grip for optimal wet use on eyebrows, underarm or bikini hair. 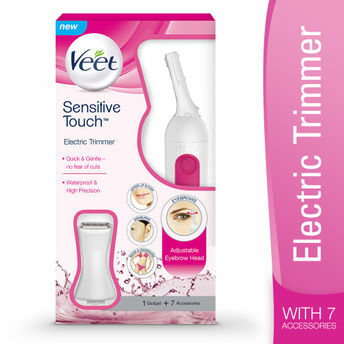 The Veet Sensitive Touch Expert has cutting blades that don't touch the skin. Dedicated accessories included to achieve precise shaping and styling. 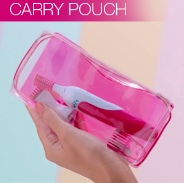 Includes carry pouch to carry anywhere. Use the precision adjustable head and tilt it for even greater precision and comfort of use. Choose between the 2mm or 4mm combs and place it on the eyebrow head. Trim against the direction of hair growth. 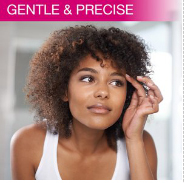 The 2-sided precision adjustable head, 16mm or 6mm, allows for optimal eyebrow shaping. Enjoy stunning eyebrows thanks to Veet Sensitive Precision Beauty Styler. Also for use on tiny facial hairs, peach fuzz, and nose hairs! Maintain those small bikini hairs before heading to the pool or beach. 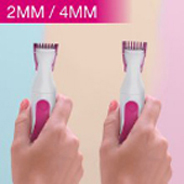 Put the large comb head on the body of the device and choose between the 2 different combs (2mm and 4mm). On dry skin or under the shower, trim your bikini line by placing the device on your skin and moving in the opposite direction of hair growth. The horizontal trimmer head helps you achieve precise styling. Most ideal for quick touch ups. To switch to a different trimmer head, simply twist the existing attachment and release. Enjoy the amazing results and a gentle finish. You can also use to trim your underarms. 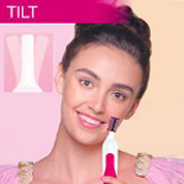 Attach desired trimmer head by inserting into the top body of device and twist until it clicks. 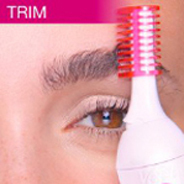 Benefit For optimal eyebrow shaping For uniform hair length For gentle and precise trimming For a uniform hair length To keep the trimmer working efficiently Your device is ready to use! 1. How do I clean the product? 2. Is the battery replaceable? Is it re-chargeable? A. The battery is not re-chargeable. Once exhausted, we recommend you replace the battery with an Alkaline AA battery. 3. Can I use the trimmer under the shower? 4. Is Veet Sensitive Touch completely safe for my skin? A: Yes. 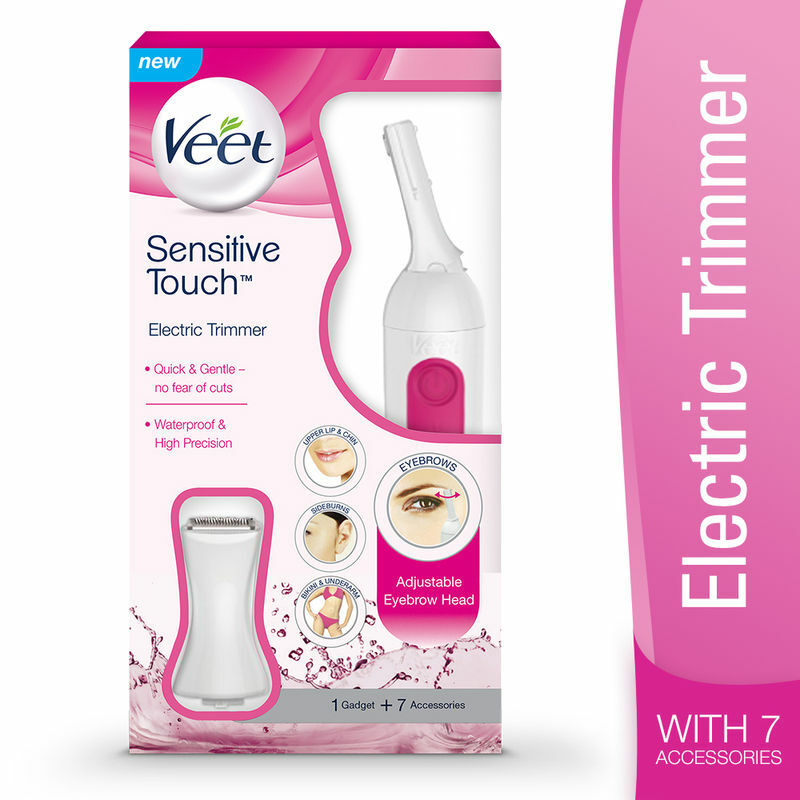 The trimmer’s blades have no direct contact with your skin hence there are no risks of cuts. 5. How do I use the extensions of the product? A. Please watch the video on the product page or read the instructions in the leaflet provided in the box. 6. Which Veet products can I use for other parts of the body? 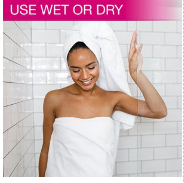 A: If you want hair removal from the root, you could consider using Veet Hair Removal Cream or Veet Waxing Kit. Explore the entire range of Bikini Trimmers available on Nykaa. Shop more Veet products here.You can browse through the complete world of Veet Bikini Trimmers .